Gold Coast baby Lilliana is doing a lot better. GOLD Coast baby Lilliana Sheridan almost died two weeks ago while on holidays in Thailand and now she is dancing, smiling and making her parents happy again. 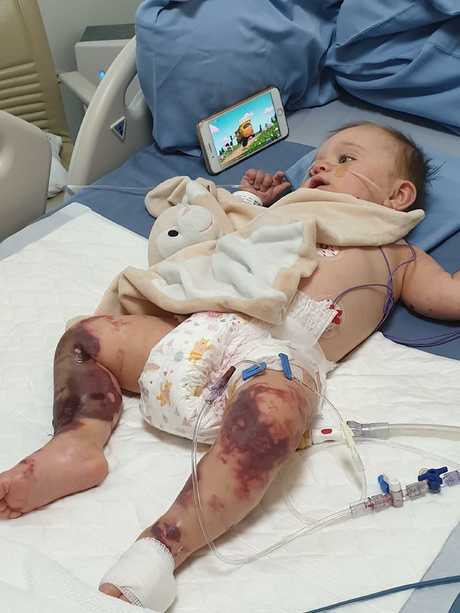 The eight-month-old contracted meningococcal as a result of septic poisoning. The disease almost killed her, once she survived there was a serious threat her legs would have to be amputated. 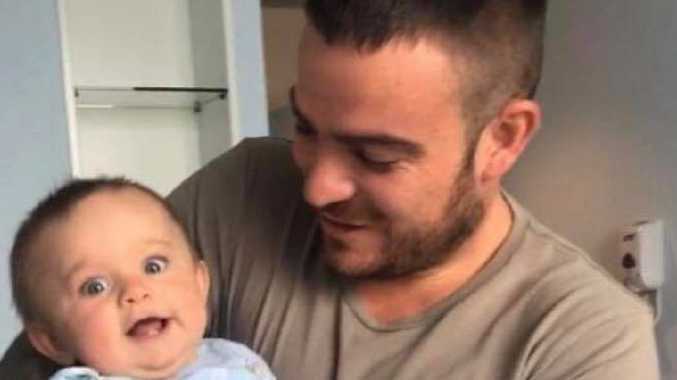 It was a week of hell for parents Jai Sheridan, Elisha Robinson and their family but doctors in two Thai hospitals turned their trip around. 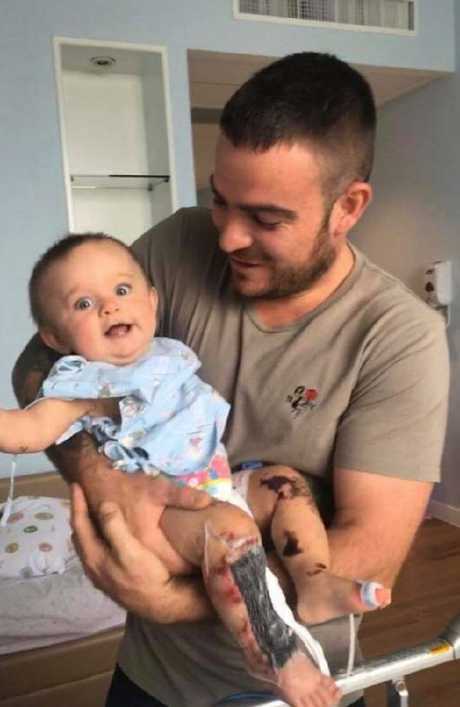 Gold Coast baby Lilliana is doing a let better, playing and dancing with her dad Jai Sheridan after she contracted meningococcal while on holidays in Thailand. "She's a gem, smiles all day besides when she's sleeping," Mr Sheridan said. "She's still on pain killers but that doesn't stop her at all, she dances and always wants to sit up." 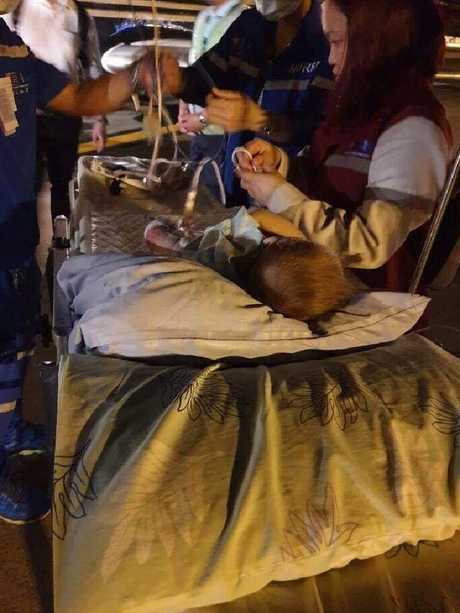 Last week Lilliana was flown in an emergency ambulance aeroplane from Phuket to Bangkok for an operation to cut the rotten flesh from her legs. "(Doctors) are fairly confident that the infection is gone but like being on any antibiotics you have to finish the course to make sure it has killed off everything," Mr Sheridan said. Baby Lilliana Sheridan nearly lost her legs. Baby Lilliana Sheridan in Thailand with her mother Elisha Robinson. "The blood circulation to her legs is great and they haven't had to take more skin off. "All her blood levels are back to normal and all other marks from the infection are drying out and starting to lift like a wound would." Mr Sheridan said he still didn't know when Lilliana would be healthy enough to return to Australia but is just grateful she has improved. On October 27 while on holiday in Phuket Ms Robinson held her limp daughter as they raced to get her to hospital. Lilliana's arms and legs had turned black and blue as the swelling damaged her nerves and blood couldn't get to the end of her limbs. She needed urgent blood transfusions and was a serious risk of losing her legs. Lilliana's mum Elisha Robinson made a heartfelt plea for people to donate O negative blood as there was none left in the hospital for Lilliana. "My baby is dying in Bangkok Hospital Phuket Town," she wrote on Facebook last Friday. "She needs O negative blood, please help me, someone please, I'm begging I can't lose my baby." Within a day 1000 people donated blood and Lilliana began to recover. 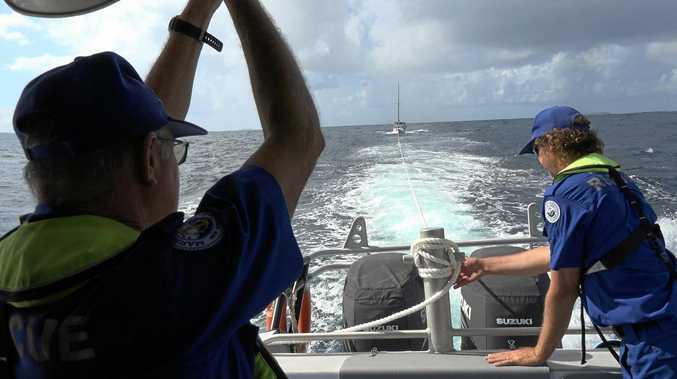 She stabilised and was transported from Phuket to Bangkok.